What is Philly's first theater? Philadelphia is well-established as a destination for the performing arts--Walnut Street Theatre, The Wilma Theater, The Kimmel Center, local universities and many, many more institutions continue to make sure of that. But where did that theatrical legacy begin? Curious to know more, we reached out to Peter Schmitz, senior lecturer in Theater History for the University of the Arts, for an explanation. The world is full of questions we all want answers to, but are either too embarrassed, time-crunched or intimidated to actually ask. With Infrequently Asked Questions, we set out to answer those shared curiosities. Have a question you want answered? Send an email to entertainment@phillyvoice.com, and we’ll find an expert who can give you the answer you’re craving. Well, as a matter of history, there are several ways of answering this. During the 18th century, there were touring companies consisting mostly of English actors who were barnstorming the American colonies. When they played Philadelphia, they tended to perform in a warehouse on Water Street owned by William Plumstead. However, the Quakers who ran the city were hostile to the performing arts, as a matter of religious principle, and the acting companies were quickly run out of town. This warehouse was hardly what we would call a proper theater--it probably just had a platform, a curtain and some wooden benches--but, with my modern liberal attitude, I would call Plumstead's Warehouse a "found space." Subsequently, two theater buildings were constructed before the revolution by a group of traveling British players called, variously, "The Hallam Company," "The London Company" and "The American Company." The first, called the Society Hill, was built in 1759 just on the other side of Cedar Street--what we would now call South Street--in the area that was technically a different township, called Southwark. But, it was shut down in six months, and the actors left the area. 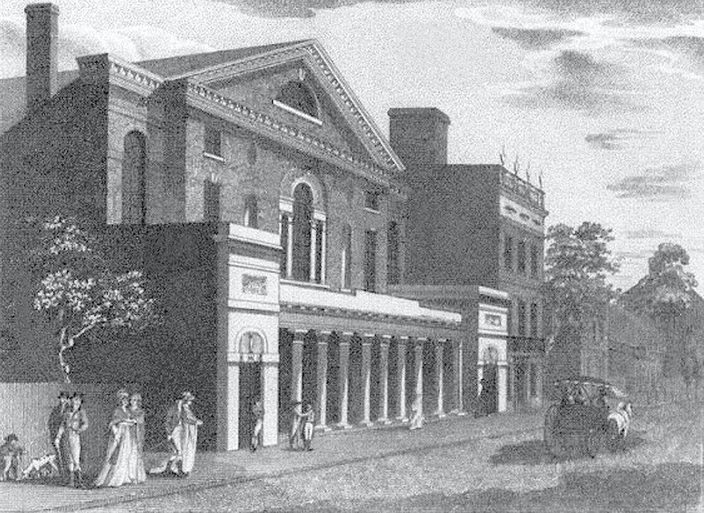 In 1766, the company returned and built what is considered the first permanent theater in America, called the Southwark Theatre. Again, it was just outside of the city limits, on the southern side of the intersection of Fourth and South streets. It held about 800 people; it was not a gracious structure, however, and had many inconveniences. Nonetheless, it was to stand for many years as a low-quality performance venue. The acting companies who would tour up and down the East Coast would use it as necessary. It was even used by the British Army officers during the occupation of Philadelphia in the Revolutionary War to stage their own private plays, shows and entertainment. Although it was not used at a theater space after 1817, it survived as a building until 1913--outliving many of its fancier subsequent rivals like the Chestnut, the Arch Street Theater and the National Theater. After the war, the power of the city's anti-theater Quaker leadership was no longer so strong--and it was the national capital. President George Washington was now a resident, and he loved going to the theater. The old Southwark Theatre structure was sadly lacking in amenities. So, Thomas Wignell, who was a former comedian of The American Company, and musician Alexander Reinagle put together a new company of players and built a fine new theater on the northwest corner of Sixth and Chestnut streets. Modeled after the Theatre Royal in Bath, England, it was directly across the intersection from Independence Hall and a block away from the president's house. It seated about 1200 or so people. It became the premier theater company in Philadelphia for some time, although it did have to alternate performance evenings with its main competitor, nearby Rickett's Circus--which was also enthusiastically patronized by President Washington. Rickett's Circus burned down in 1799, and the national capital moved down to the District of Columbia. The Chestnut Street Theater, nonetheless, stayed the premier entertainment venue, and the most prestigious theatrical company in town. It burned down in 1820 but was rebuilt. What was the Quaker objection to the theater? Though the earliest Quakers did generally at first like singing in prayer, by the 18th century they were generally against the performing and the arts--not only because they were a "representation" of things that should be experienced directly, but also because mainly because they were regarded as "idleness," not part of thrifty and industrious life that all Quakers were expected to practice. Spending on theater tickets was a waste of money and time. Moreover, the theater especially was seen as a place of social distinctions, where rich people sat in better seats than the common pit. This was anathema to the Society of Friends, who believed in social equality. When did Rittenhouse Square get its ritzy rep? Can you go blind by staring at the sun? What's the difference between the sugar substitutes? It was the Puritanical heritage of Boston and New England that was more concerned with "cozenage," or lying, and equivocation, that was at the very heart of the practice of theater. As well as the supposed immorality of its actors and actresses. It was also welcome in colleges! Some of the earliest records we have of plays were by the students at University of Pennsylvania, Princeton, William and Mary, etc. After the war, theater and the performing, as a commercial endeavor, became more respectable. One of the ways an entrepreneur could get ahead in the world, and making money, was always a good thing. If colonial theater thrived in the south, why didn't they have the first permanent theater? [Philadelphia got the first theater] because of the size of the city. Theater players always wanted to establish a major theater in New York, Philadelphia, Boston, because they were the big cities. Charleston and Williamsburg and even Baltimore weren't really big enough to have a population to really drive them. Philly was the biggest city in the colonies, of course. The Big Apple, as it were. And during the revolution itself, Congress forbid theatrical activity--again, the theory people were wasting money on it and they didn't want [them] spending resources on useless things. But as soon as the war was over, entrepreneurs soon flocked to Philadelphia and it became the national capitol in 1790--the largest commercial center, seat of government, social center, and they wanted to establish here. When he became president and took up residence in Philadelphia, he was an opening night kind of guy who'd show up with Mrs. Washington and be escorted to his seat. It made it socially respectable and the old prejudice was soon overcome.